1) Seeing God's redemption in an old friend who walked in darkness for a long time. Jesus saves. 2) Friendships with high schoolers. Age is just a number. 3) Chatting about the woes and blessings of being a YL leader with a dear friend. Julia, I am so glad you're here this weekend. Oh and thank you for asking...my shin hurts more each day. My Mars sized bruise is quite colorful and not to mention, I plan on wearing a skirt to the Waste Management Open tomorrow (yep, it is no longer the FBR Open. Kinda trashy, right?). 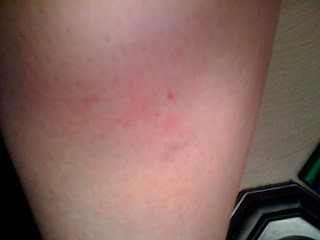 I hope no one thinks my legs are a case of domestic violence (Mandy can be feisty at times, though). I'm finding, in this little task I have set for myself, that God's goodness repeatedly being revealed in the same things. Why has it taken me this long to see Him in these little things? I am a human and I am imperfect. Gosh, I am thankful He is in control and I am not. 1) The BK group. Once every month and little group of Young Life staff women meet to encourage, dialogue and pray for each other. I am thankful to have women like them supporting me. 2) Catching up with Stephanie over ice tea and tears. She is just so easy to talk to. 3) I can't say this enough...the Wednesdays remind me each week how much God loves me. It is a privilege to be a part of the lives of so many amazing women. Inspired by my brother-in-law, I've started hiking Camelback Mountain a couple times a week. If you are unfamiliar with this beast, it is considered "the Everest of the Valley" (it's hardly Everest, but it is challenging for the amateur hiker). There are two trails to the top, Echo Canyon and Cholla. I prefer Echo Canyon for a couple different reasons: the railings (on the steep parts) make me feel like I am a rock climber (barely) and the never ending cascade of boulders makes the hike more interesting and challenging. I've gotten into the habit of hiking it up and jogging it down. Hopping from rock to rock has become a little game I play with myself....until today....game off. Since it has been raining the last couple days here in the desert, there is much more gravel on the trail. As I was skipping down the mountain (trying not to be passed by my nimble, and fast b-i-l, Brooks) I slipped and slammed my shin into a sharply edged rock and my wrist bent a way it was not designed to bend. After a couple curse words and brief water break, I was back to my bouncing. I was almost to the bottom, I could see the trailhead, and as I was passing a couple mid-20 year old guys, I slipped again. This time my hand caught my face from slamming into the boulder I was maneuvering around (thankfully). As a result of my clumsy feet today, I have achey wrists, raw palms, sore ankles, a bruise the size of Mars, and a golfball sized bump on my shin. This picture doesn't even do my injury justice. AND I am not asking for pity here...just using this as evidence that God did not design me to be a graceful Gina. This is for yesterday and today's will come tonight. 1) Rest. Why does it still surprise me that He knows what I need? 2) My family. They bring me so much joy. 3) My mom's cooking. Seriously, I can't say it enough. She's amazing. Last night was pot roast. A classic, but a goodie. 1) Sleeping so hard I don't wake up until my alarm goes off. This is a rarity in my sleeping patterns. God knows I need rest. 2) Being told I have beautiful eyes from my eye doctor (I need to be reminded that my eyes are not boring). God gave me these eyes to see the world as He created it. 3) Being reminded that God authors incredible stories in each of our lives. What a fabulous weekend I had with the Scottsdale Young Life and WyldLife leaders. From sledding into mud and staging a murder mystery to playing sardines in the dark and staying up late watching movies; I had the most fun I have had in a long time. From worshipping our Creator and spending time listening to the Lord to taking communion and praying for each other; I am blessed to be in a community of believers who are seeking Christ. Friday: Excited middle schoolers who call me friend. Saturday: The simple number three. Cramming into a 3 feet by 3 feet space with 3 people and waiting for 30 minutes for someone to find us. 1) The subculture of Young Life Area Directors. I am encouraged when I am surrounded by 40 missionaries who are passionate about hurting and lost kids knowing our Creator. 2) Seeing my high school friends get fired up about Jesus. 3) A sweet, real, and vulnerable conversation over some hocho and chai. I see Christ in you daily VR. 1) Doing the "super baby" with Stella. It has become our special thing. If you haven't seen it...I'll try to describe it. I hold her up over my head from her waste while yelling "Super babyyyyy!" and she screams while taking the pose of a superhero. To be so fearless and carefree is a God-given gift. 2) Conviction and confirmation. He has gifted us with the Holy Spirit. 3) Ending the day with birthday celebration with our great group of friends. Happy Birthday Blake! 1) Another day of beautiful weather. Excuse me for this double negative, but I just can't be unhappy when God seems to put Arizona in this perfect little ozone. 2) Great conversation and laughs with Kathy. She can speak straight to my heart. 3) Starting my taxes and realizing that I will be getting back more than I had expected. God provides. As I was digging through all my files and piles of paperwork looking for a very specific piece important to finish filing my taxes (that always seems to happen like that, right? ), I came across the bag of keepsakes (or some may describe as just stuff) from my six week adventure from this past summer. From London to Italy to Uganda, I had a bag full of little things that held memories. One was a program from the choral service we went to at Westminster Abbey in London. Westminster Abbey is steeped in more than a thousand years of history. Benedictine monks first came to this site in the middle of the tenth century, establishing a tradition of daily worship which continues to this day. The Abbey has been the coronation church since 1066 and is the final resting place of seventeen monarchs. The present church, begun by Henry III in 1245, is one of the most important Gothic buildings in the country, with the medieval shrine of an Anglo-Saxon saint still at its heart. On the back of the program, I had written a prayer that I heard during the service. So remember how I said I was going to start a little series called "behind the tinted windows"? Well, of course, as soon as I think I have a great series of unusual stories to tell you, they all seem to come to a halt....until today. I always like looking at people as I pass them on the freeway. My curiosity goes crazy over seeing confused, frustrated, distracted, happy, or dazed drivers. As I peer to car next to me, I am often thinking...I wonder how their day is going. I was exiting the trusty 101 freeway today and I glanced over at the old green Buick that seemed to be driving (irritatingly) slow. To my surprise, perched on the driver's shoulder was a large bird. Just chillin' like it's a normal thing to be sitting on his owner's shoulder cruisin' down the freeway. I erupted in laughter and continued to laugh for the following five minutes. 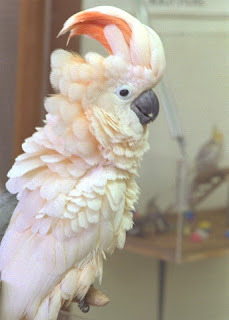 This is to give you an idea of what this feathered creature looked like, but picture it being about two feet tall. I went into the weekend with a cold and came out rested, but missing the cyber world writing that I have slacked off on these past few days. Regardless, God is still evident and consistent in all parts of my life. Here is a goodness from each day I slacked and God didn't. The Olympics. It seems that somehow in all the mayhem of this world, that countries can put aside differences and conflict and share one commonality: ridiculously good athletes. Celebrating Jordan as she prepares to become Mrs. Whitlach. Being able to celebrate the God-given covenant of marriage is a privilege. 1) In spite of it being Valentine's Day, I am so very thankful to have those I love so near to me. Mandy and I celebrated this day with people I love. Mom, Erin, Brooks, Stella, Bean, and Grandma, thank you for loving me so well. 2) Knowing that we are all a part of God's HUGE plan for our lives. We are just riding His wave. In church, Pastor Jamie used this illustration to show us what being a part of God's wave looks like. Pretty exciting and humbling when you think about it. Driving with my windows down and Ray Lamontagne up. God created Arizona for days with 75 degree sunny weather (I begin to doubt why He created it when it's a boiling 110 in July). Woops, I went to bed yesterday forgetting to post. It must be this cold that kept me up all night. Blasted stuffy, runny nose and phlegm. 1) Having a hard, but encouraging conversation with JI. God knows my heart. 2) Free Chick-fil-a sandwiches. Seriously, CFA+Yogurtology in the same week...risky, but nice. 3) Worshipping with 30 high schoolers. Your love never fails. 1) Hiking Camelback Mountain and seeing how beautiful the valley really is (for those of you who say Arizona isn't green, look from above). He created all this. 2) Being able to be a sounding board to my sister. I am blessed to have the same in her. 3) Understanding a little bit more God's love for me...just as I am. God is patient, God is kind. He does not envy, He does not boast, He is not proud. He is not rude, He is not self-seeking, He is not easily angered, He keeps no record of wrongs. God does not delight in evil but rejoices with the truth. He always protects, always trusts, always hopes, always perseveres. Did you know St. Valentine was a Christian martyr who spread the love of God in prisons? 1) Being able to pray over our area, community, and ministry at a set time each week. He listens. 2) Getting excited about high school romances (no, not mine). I know God giggles at our simple pleasures. 3) 35 cent Tuesdays at Yogurtology. Why is this stuff so good? 1) Getting some well needed rest. He knows how to take care of me. 2) Having friends volunteer their night to blow a whistle at 200 high schoolers at our All Scottsdale Young Life Dodgeball Tournament so that they can experience Jesus. 3) Being able to text my boss "great job with the balls tonight!" and getting the response "that's what she said" back. He created humor. Whelp, just got back from spending the weekend with 400 middle schoolers, so I will post one from each day I was up north. Friday: Having curious 6th graders ask me a million questions. He created curiosity. Saturday: Witnessing seven 12-year-olds have an "ah ha" moment after hearing the cross message. He chose me to be a part of His work. Sunday: Spending an evening eating good food with good company and celebrating the life of a spectacular woman, my mom. I am blessed to have such a wonderful mom. If you don't know her...you should. She is the best cook in the world, she cares and gives of herself to our family more than I can explain, her creativity inspires me, she listens to me even when I'm being ridiculous, and she loves me unconditionally. She is one very special lady. 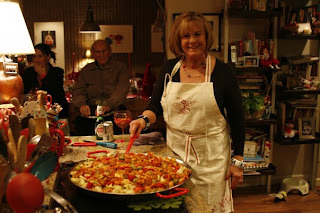 This is the (absolutely delicious) paella she made for Christmas dinner. Today was a good (and tiring) day. God showed me His goodness in so many ways. I will leave you with a few as I pack for WyldLife camp and head to bed early. 1) He is evident in volunteer leaders even when they aren't using words. He gives us purpose. 2) Fighting with 2 high schoolers over who gets to pay for the frozen yogurt and still finding $10 in my purse after I drop them off. He provides. 3) Having a WyldLife girl who I've been praying for all year sign up for camp the night before we leave. It is in His timing. In our Wednesday night Bible study, we're going through Philippians and reading the book Embracing the Love of God by James Bryan Smith (if you haven't read it yet, you should. It's fabulous.) The first chapter starts with a quote by St. Augustine, "By loving us, God makes us lovable." Lately, everything in my life (as it should always) seems to point to my need for a Savior. Or maybe it is that I have been opening my eyes wider when my need for a Savior has been there all along. I claim the latter. It still fascinates me that God is the only reason we are even able to experience love. The only reason why we exist and can experience Him is because He loves us, because He is love. Smith quotes the fourteenth-century mystic Julian of Norwich saying "Everything is enwrapped in love and is part of a world produced not by mechanical necessity but by a passionate desire." So as I look back on my Wednesday, I am looking at the things that prove everything is "enwrapped in love," God is good, and that He is love. 1) Celebrating my mom's 58th 29th birthday with women twice my age. He made life fun. 2) The administration at a secular, public school loves having us, Jesus followers, on campus to just hang out with kids. When we show up, God does too. 3) Having Godly women I can pray, worship, laugh, and learn with on a weekly basis. God has a plan. 1) Knowing I am in the right place at the right time. Thank you for guiding me. 2) God providing a [brief] nap in my afternoon. 3) 2 long overdue phone conversations with Mrs. Jordan Pitkin and JD. Good friends like them are blessings. Day 2 and this has already become my favorite way to end the day. 1) God used my sister to speak truth to me. He can use any one/thing. 2) Melodies to jam to (and sing with) in the car. He created sound. 2) My sweet Stella cried when I left today. I am loved. In light of my previous post, I decided I would list 3 things everyday until my 25th birthday [May 19] that reminded me of God's goodness. That is a feat in and of itself seeing as my last post was four months prior. I am up for the challenge though. I looked up good in my trusty thesaurus and this is what I found: acceptable, admirable, agreeable, choice, capital, commendable, congenial, deluxe, excellent, exceptional, favorable, first-class, precious, prime, gratifying, honorable, marvelous, neat, pleasing, reputable, splendid, satisfying, stupendous, superior, valuable, welcome, worthy. What an incredible list that describes God. 1) My best friend, Bonnie, shows me more and more everyday that Jesus lives in us. "Christ in us, the hope of glory." 2) My mom is comfortable praying before lunch with my friends. 3) I can get up before church and take a stroll with a dear friend in 70 degree weather.